← What wordcount should my children’s book have? 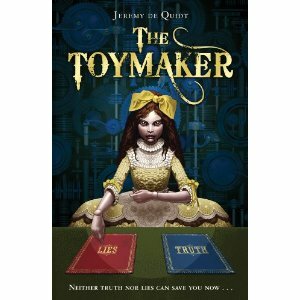 The Toymaker by Jeremy de Quidt attracted me at once with its creepy cover showing a sinister wooden doll pointing at a card marked ‘Lies’ while another one marked ‘Truth’ lies beside it. Essentially it is a breath-snatching chase through a fantasy land where life is hard, people are cruel and dangerous and a toymaker can cut up animals and put their hearts in his creations. The two main characters, magician’s helper Mathias and maid Katta, spend most of the book on the run from a vicious, murderous dwarf and his master Leiter, who is searching for a piece of paper that belonged to Mathias’s supposed grandfather. Their escapes are narrow and both suffer terribly through the book. There are few sympathetic characters apart from the children; adults are selfish, manipulative and frequently violent. Without giving too much away, the book ends with the death of one of the main characters. Taking these points into consideration, I won’t be passing it on to my twelve year old son to read as I think he would find it too distressing, although horror fans of that age will probably lap it up the gory details. My other concern with this book is the way it ends. Research online does not reveal it is the start of a series and yet that is exactly how it reads. There is a late plot development which reveals the real reason behind the chase, but to me it feels too late and so it is unconvincing if this book is to stand alone. I also feel the title is misleading; again, unless it is the start of a series, the Toymaker does not play much part in the actual story. I would like to have found out more about Marguerite, the doll who can tell truth from lies, and again she is given prominence on the cover but takes a small part in the actual tale. I was left feeling frustrated that the plot had really just begun and I was being pushed back out of the story. The author writes beautifully and he has a real sense for the macabre; the atmosphere is chilling and the escape scenes nail-bitingly thrilling. A longer book with a resolution, or packaging of the book as the first in a series, would make the experience more complete – although I would still only recommend it for children with a strong stomach and the emotional maturity to cope with a traumatic ending. This entry was posted in books, review and tagged Jeremy de Quidt, The Toymaker. Bookmark the permalink.